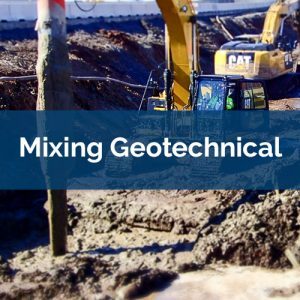 Geo-Solutions offers state-of-the-art soil mixing techniques that can be used to solve geotechnical, environmental, or geoenvironmental construction needs. 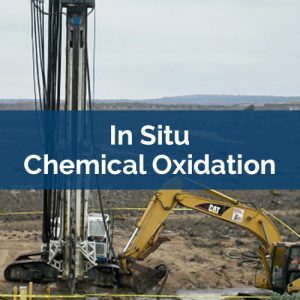 On environmental remediation projects, Geo-Solutions can offer numerous solutions to remediate soil and wastes in-situ, including In-Situ Solidification/Stabilization (often referred to as ISS or S/S), In Situ Chemical Oxidation (ISCO), or In Situ Chemical Reduction (ISCR). 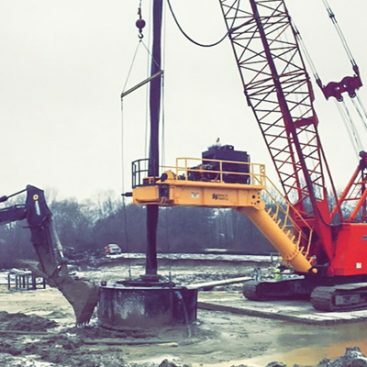 On geotechnical projects, Geo-Solutions can offer soil mixing solutions to accomplish liquefaction potential reduction, bearing capacity improvement, slope stability improvement, or methods for the installation of excavation support systems. 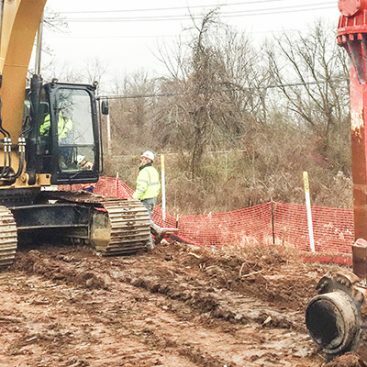 Since most underground projects involve a geotechnical and environmental component, Geo-Solutions is well versed in the interplay between these two disciplines, often termed geoenvironmental, and has numerous soil mixing techniques suitable for solving problems in this complicated area. 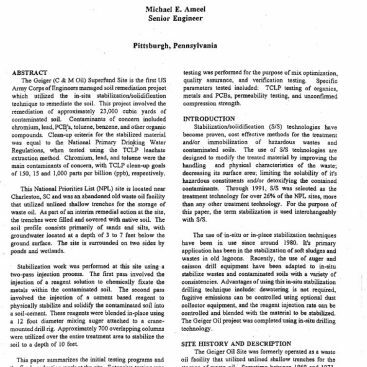 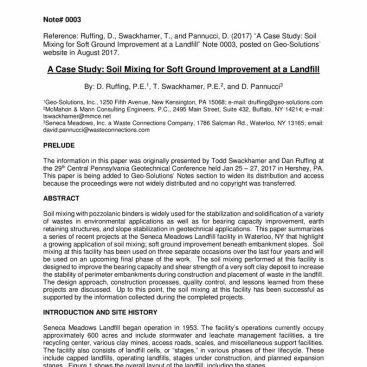 Soil mixing has been a cost effective solution for solving environmental and geotechnical problems for nearly 3 decades and its use continues to increase as Owners and Engineers realize the technical benefits and cost savings of soil mixing relative to other available options, e.g. 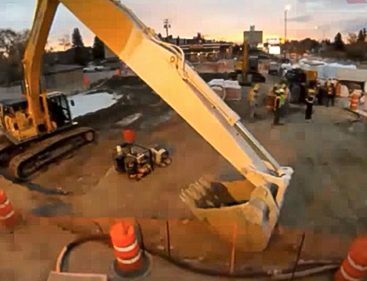 excavation and disposal. 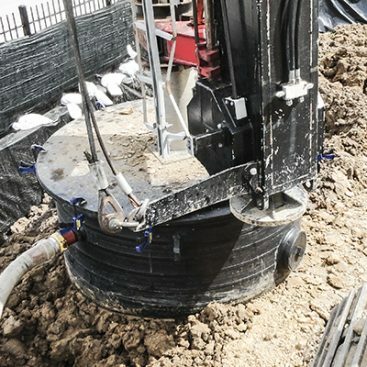 Geo-Solutions soil mixing construction solutions can be used on shallow sites (~2’ to ~20’ below grade) and deep sites (~20’ to ~100’ below grade). 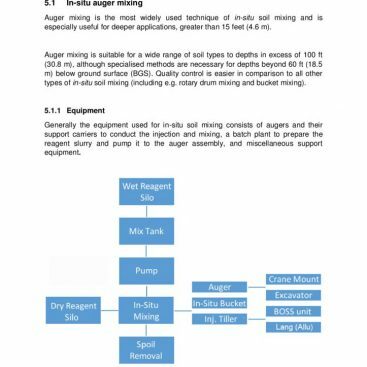 The terms and acronyms Shallow Soil Mixing (SSM) and Deep Soil Mixing (DSM) are often used in the industry to describe soil mixing applications at different depths. 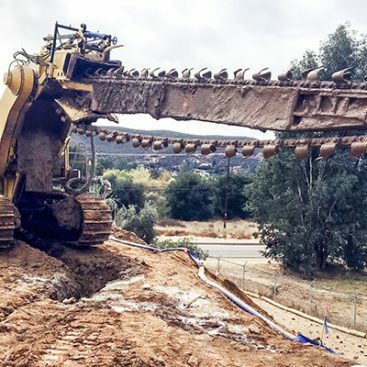 Geo-Solutions can perform soil mixing in-situ using excavator bucket mixing, rotary tool mixing, single auger mixing, multi-auger mixing, and chain (trencher) mixing. 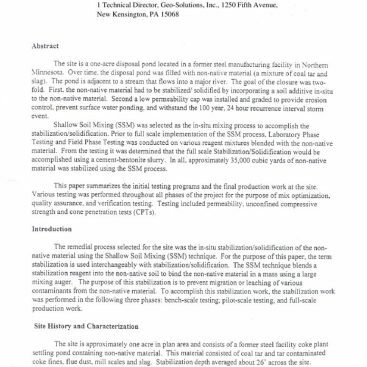 Geo-Solutions is also capable of performing soil mixing ex-situ when site needs dictate. 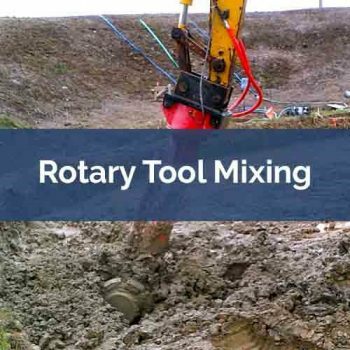 Ex-situ mixing can be performed on open ground or in controlled volume mix containers using excavator buckets or rotary tools. 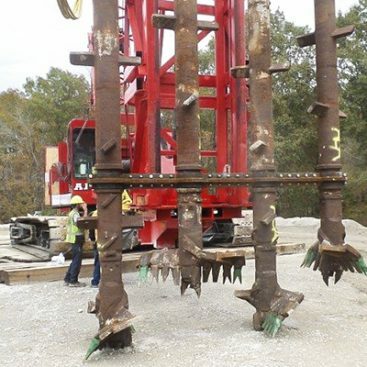 Geo-Solutions owns all of the specialty equipment needed for the successful completion of soil mixing, including custom modified caisson type drill rigs on tracked chassis, custom drill rigs designed for crane mounted systems, a chain type soil mixing machine on a tracked chassis (the Geo-Trencher), rotary mixing heads, and numerous batch type, automated, and continuous mix batch plants. 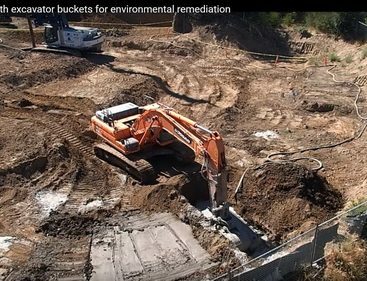 Contact Geo-Solutions today about your project and we will discuss how soil mixing can be used to solve your soil or groundwater problem. 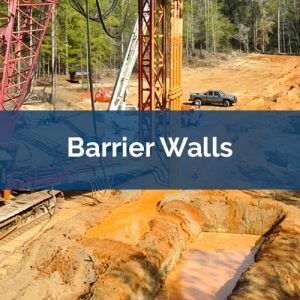 Need barrier walls to help control the spread of contaminants? 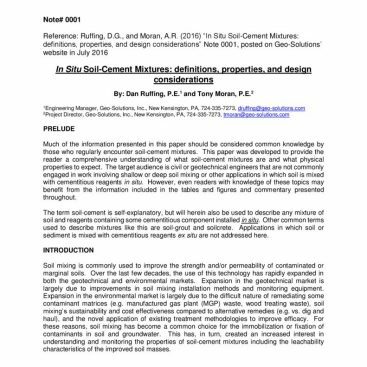 Learn how Geo-Solutions can increase bearing capacity and reduce movement when soil mixing. 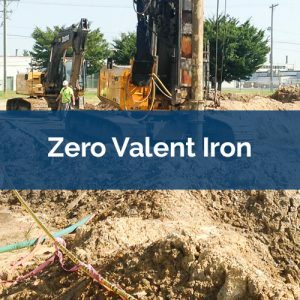 Zero valent iron aids in reducing the contaminants to less harmful constituents it is used with bentonite slurry to reduce the permeability therefore reducing the flow of contaminants. 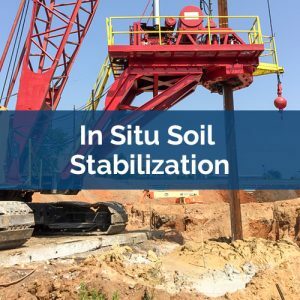 Geotechnical soil mixing is used in settlement control of soft soils supporting embankments, stabilize critical slopes, form a composite gravity structure to support excavations. 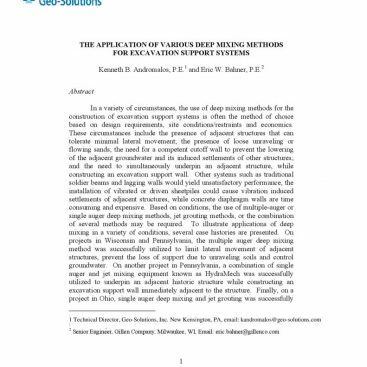 Seeking soil mixing at shallow depths? 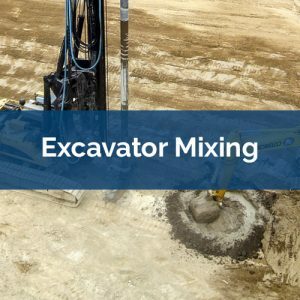 Excavator mixing may be your most cost effective method. 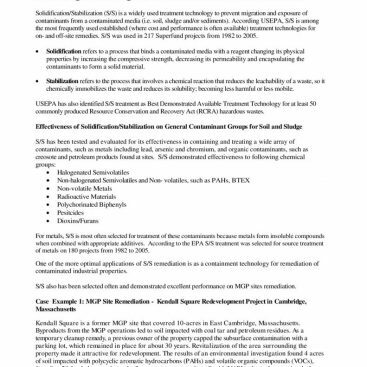 Geo-Solutions has been a leader in the In-Situ Treatment / Stabilization / Solidification of Manufactured Gas Plant (MGP) wastes using a variation of In-Situ Soil Mixing methods. 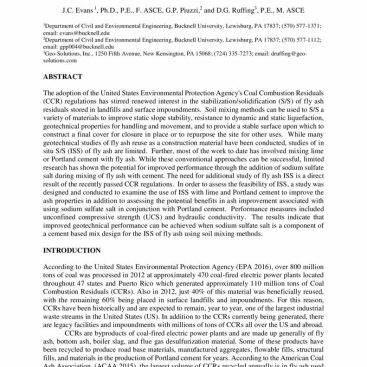 By injecting reactive chemicals, Geo-Solutions can help destroy contaminants where they reside. 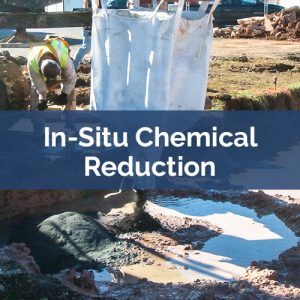 Learn more how in-situ chemical reduction can save you time and money by changing contaminants to less toxic forms. 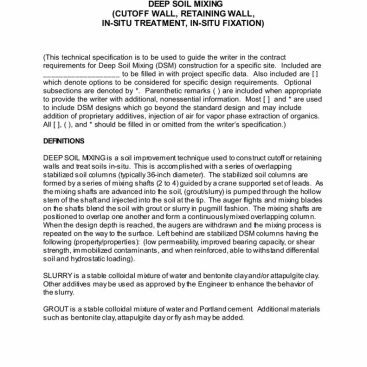 In this method, the soils are often pre-excavated with a conventional excavator as grout is added to the mixing “cell”. 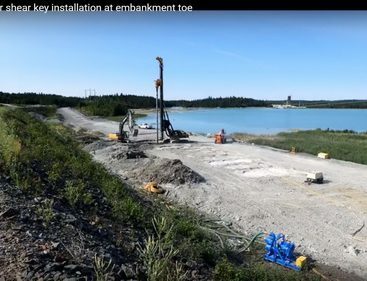 Learn more about us in person. 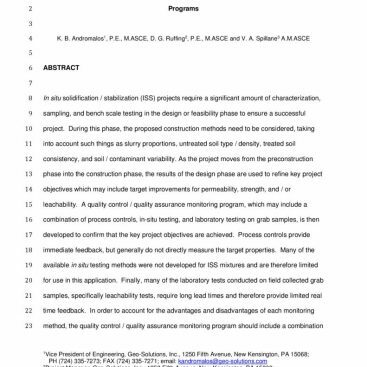 Sign up for a "Brown Bag Lunch" seminar that will provide a general overview of our company and our services. 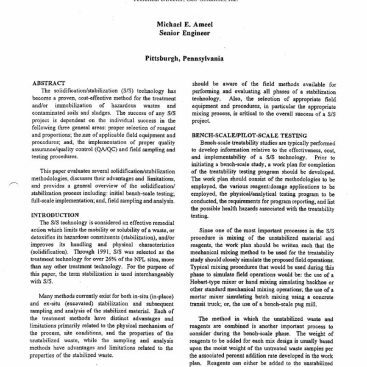 Let us know what your remedial needs are and we will tailor our presentation accordingly. 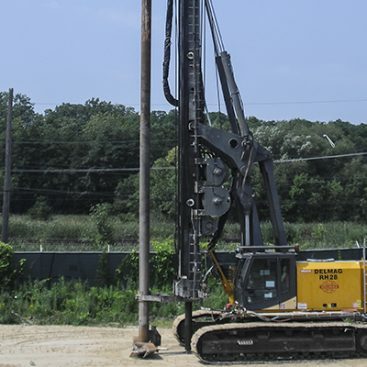 Geo-Solutions is able to furnish the following necessary specialty equipment for soil mixing services. 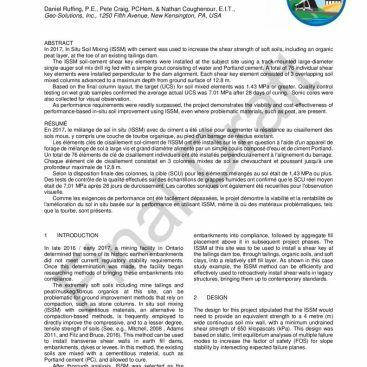 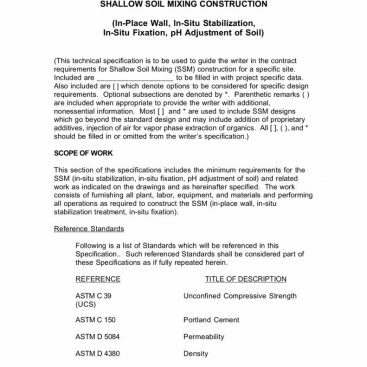 The following are sample specifications of Soil Mixing. 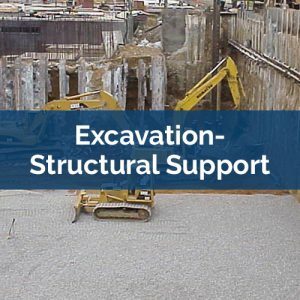 This is a unique resource for use by owners and engineers that find themselves faced with problems on their sites. 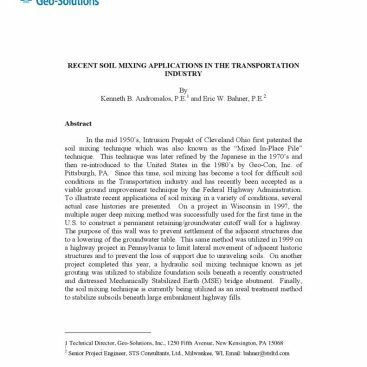 There are many publications written by Geo-Solutions’ Staff and other industry leaders, which focus on detailed technical aspects of Soil Mixing.